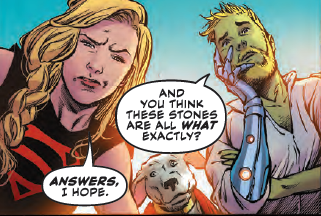 Kara Zor-El is trying to relax with Krypto the dog and a new found friend with a secret when a collection of crystals prompts unexpected enlightenment in the latest installment of Supergirl. Marc Andreyko’s story feels a bit rushed as events escalate in an issue drawn by Eduardo Pansica and Julio Farreira with color by FCO Plascencia. The sudden lurching together of an adventure that could have been much more sweeping and massive is a disappointment as exposition is diligently crunched through on an unwavering launch into danger for Supergirl, her dog and her mysterious friend. Kara, Krypto, and Z’Ndr Kol are hanging out in the idyllic scenery of Planet Tavaar. Z’Ndr wrestles with telling Kara about his past when Krypto shows-up with a parcel of crystals in his mouth. As it turns out those crystals, when combined with a few others reveal a secret confession left by one of the Guardians of the Universe who...well...delivers a hell of a lot of exposition regarding Rogol Zaar...a being who claims to have been the one who destroyed Kara’s home planet of Krypton. Naturally, things get complicated when followers of Zaar arrive to vanquish a daughter of Krypton. Andreyko’s set-up for this spacefaring series of Supergirl stories had a great deal of potential. Various crystals had been evidently scattered all over the galaxy, and it was up to Supergirl, her dog and her demon ax from hell to collect them all to discover the truth. Kara could have shot through the universe engaging in all kinds of weird adventure. Instead, Andreyko cuts the adventure short this issue with lots and lots of generally un-engaging exposition punctuated by an action sequence terminating in a cliffhanger. It’s disappointing, but it DOES free Kara up to rush off in some other direction the might ultimately be more promising than an ongoing space fantasy adventure. If nothing else, the attack of the Followers of Zaar and the somewhat unexpected power of Zara’s ax proves to be a bright spot in an otherwise dull issue. Pansica and Farreira are great with the action sequences in the issue. From flashbacks to the attack by the followers of Zaar, cosmic action slices across the page with a great sense of motion. Sadly, the detail in that action feels a bit sparse. (There IS one rather impressive punch executed by Kara, Pansica and Farreira, but most of the detail gets lost in the motion of the action.) As does the intensity of the drama that so much of the issue’s story hinges on. So much of the dramatic intensity in any scene lies flat on the page when it should be swiftly shooting across it with the dynamic energy of the physical action. Thankfully, Plascensia’s vibrant colors do much to amplify the visual appeal of the issue. A muddled delivery of the rather sudden end to a grand quest is further muted by a substantial amount of exposition. With any luck, Andreyko and company are adjusting for a new direction with one of DC’s most iconic superheroes. This issue, however, lacks the kind of impact it really needed to have to live up to its potential.